The High Atlas mountains are possibly the greatest mountain range of North Africa. They are arguably the most beautiful and intriguing part of Morocco. The region has retained a remoteness which until recent decades was virtually complete, and contains villages where the way of life has changed very little for centuries. Morocco is an exotic country of vibrant contrasts: from sandy beaches and impressive mountains to lush forests and scorching deserts. There are few places on earth where you can travel with such ease between fantastic Arabian Nights style cities and the remote wilderness, scattered with isolated and picturesque settlements. It is the northern gateway to Africa and is said to be the closest destination to the UK where you can expect to see a totally different culture to our own. It is an affordable and increasingly popular holiday destination and thanks to its wonderful climate, it is pleasant to visit all year round. Exploring the high peaks of the Atlas Mountains on foot is a truly rewarding experience. A hike amidst the cool vegetation of juniper and pine trees is a perfect way to rejuvenate your mind and body. Go across deep gorges, gushing river streams and groves of cherry and walnut trees, as your guide takes you on a great walk up and down the beautiful hills. The valleys are home to tiny hamlets and villages of the ethnic Berbers, a herding and farming community. Visit their homes and interact with them to get to know more about their ancient traditions and customs. See their terraced fields of corn and barley and get a glimpse of their day to day living. Berbers make up approximately 33% of the Moroccan population, being outnumbered significantly by Arabs. Historically and culturally separate, tensions continue between these two groups to this day, although they share a common religion in Islam. Traditional Berber friendliness, generosity and helpfulness remain prevalent and a possible invitation to share tea and biscuits with a local family always lies around the next corner. Such occasions present the best opportunity to gain an insight into their daily life and will enrich your visit to Morocco. In common with many mountain people around the world, Berbers are renowned for their pride and spirit of independence. Our packages to Morocco begin and end in the famous city of Marrakech, which is beautifully placed at the foot of the High Atlas Mountains. During your visit to this fascinating city make time to explore the souqs (markets) and wander the streets and squares of the old city where jugglers, storytellers, snake charmers and acrobats put on a magical show each evening. Arrive in Morocco and transfer from the airport to your hotel in Marrakech. After a transfer to the village of Imlil, we start our trek. We walk from Imlil (1740m) towards Tinerhourhine, hereby passing by Tamatert. We will have lunch on the col of Tizi 'n Tamatert (2279m). After lunch continue to Ouanesekra-Tamguist. Later we arrive at Tinerhourhine (1600m) where we will spend the night in a local gite. 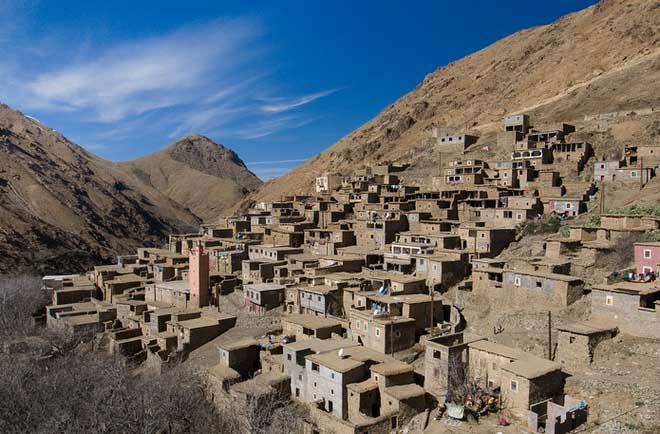 We depart from Tinerhourhine along the Imnane Valley, hereby we pass the Berber village Ikkiss (1700m). We then continue to Tizi n�? ?Aguersioual (2000m) and will have our lunch at Matate (2000m). We will spend the night in a local gite in Aït Aïssa (1800m). We depart from Aït Aïssa and walk towards Tizi Oussem (1900m). We pass by Tizi Mzik (2400m), and the village of Mzik before arriving back in Imlil where you will stop for the night. After breakfast drive back to Marrakech and spend the rest of the day exploring this fascinating city. This itinerary is intended only as a guideline. Weather conditions and other factors may alter the days events slightly. This package is available all year round. Prices are based on group size 2-4 people. Although credit and debit cards are beginning to gain some acceptance in the Atlas Mountains, this is still only fairly rare. It is safest to presume that everything in the Atlas Mountains must be paid for in cash (Moroccan dirhams). Even though ATMs are becoming much more common in towns and cities, they are yet to reach many trailheads, less so mountain villages. Those with some previous experience of mountain walking and those interested in enriching cultural experiences. This trip involves moderately difficult walking so a reasonable level of fitness is required.